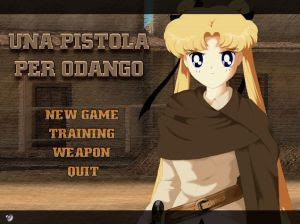 A Pistol For Odango is a freeware Sailor Moon western-themed fan-made video game. Your goal in the game is to shoot Sailor Moon DVDs and audio CDs, forming chains and combos from them, that allows you to get additional points. The faster and more accurate you shoot, the better score you get. The game has online high scores table.